Lots of commercial baby products contain some pretty yucky chemicals – which is concerning for anyone who has little kids at home. Hard to believe, but yet this is true: the government does not require safety testing on personal care products. And in terms of household cleaners, the government doesn’t require a list of ingredients OR that any of the products are tested for health and safety. When it comes to personal care products, manufacturers can use almost any chemical they want – no matter what the associated risk might be. Commercial baby wash products are just some of the most popular and most purchased items in store – heavily marketed to people who are expecting, promoted in maternity magazines in doctors offices all over the U.S., and heavily advertised in magazines, television and product campaigns A good majority contain toxic chemicals including synthetic fragrance, artificial colors and dyes, and preservatives that can affect your baby and create health issues. We need to be extra careful with our kids because they are exposed to far more contaminants than adults .Their metabolism and organ systems are not fully developed as a baby, therefore they are not quite a s capable of handling the same type of chemical assaults on their body that an adult may be able to withstand. You can find many organic body wash products out there on the market – but they cost a pretty penny. I have seen some varieties range from $5 – upwards of $30 for a single bottle. Crazy – right?! Water, peg-80 sorbitan laurate, cocamidopropyl betaine, sodium laureth sulfate,sodium lauroamphoacetate, polysorbate 20, peg-150 distearate, sodium benzoate and fragrance. May also contain: citric acid. 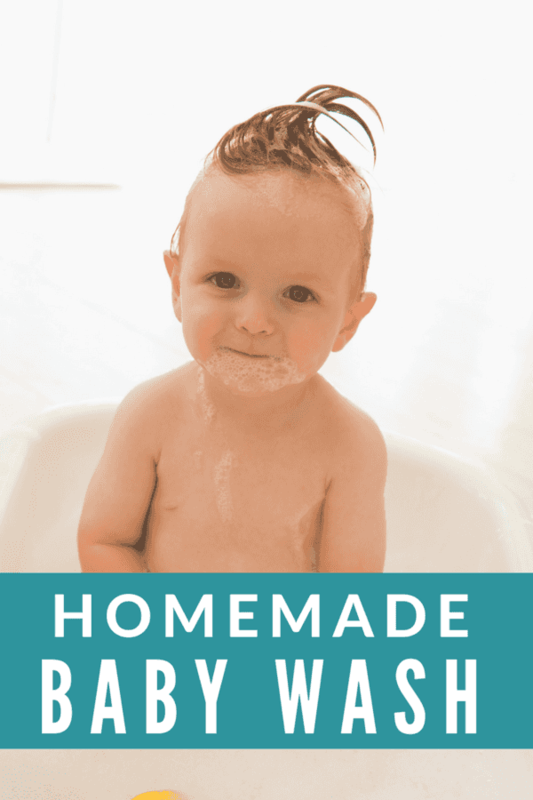 Believe it or not, making your own Homemade Baby Wash is far easier, and cheaper than anything you could buy in store. Aloe Vera helps moisturize the skin. Vegetable Glycerin will help give the baby wash some thickness as well as serve as a natural moisturizer. We have found that buying several of these foaming pumps allows us to have not just one but at least 3-4 in the bathrooms for body wash and hand soap. When you have everything readily available you tend to find making your own much easier. To make: In your foaming 10 oz pump bottle, add the castile soap, glycerin and aloe vera. Then top with distilled water and replace the lid. Use as needed on your baby. I wouldn’t suggest bathing your baby too often – we usually aim for every 4 days. As with any product, avoid using near the eyes. Use caution when selecting essential oils for your personal care items – most essential oils in store are fragrance (aromatherapy) oils that should not be applied to skin or ingested. We only use Young Living Essential Oils – and Lavender is our favorite because it’s gentle and wonderful for healthy skin.